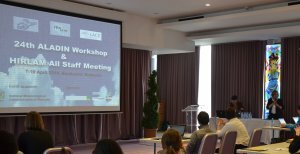 The National Meteorological Administration of Romania will host the 24th ALADIN workshop / HIRLAM All-Staff Meeting 2014 (07-10 April 2014) and HMG/CSSI meeting (11 April 2014), in Bucharest. Piet Termonia : Could there be a need for a horizontal finite-element discretization? Roger Randriamampianina : HATM (Hirlam Aladin Tools Market): Implemented tools for common use. With contribution from all centres. The participants will be hosted in Marshal Garden Hotel (also the meeting venue) or Duke Hotel (see the local organising webpage for information about the proposed hotels.